Here is an enthusiastic review of Matilde. Matilde does Markdown and RTF. The author complains that it is free. This problem seems to have been fixed. It now costs $9.95. There is still a link to "Free Licenses," but clicking it gets you to a page not found error. People will have to decide whether it's worth the money for them. In any case, I disagree with the reviewer that the sum of its parts is greater than its parts. Since it does not allow for its files to be saved in DropBox or, as far as I can tell in any other directory than the one hard-coded into it, I find it too inflexible (among other things). TypeLink is "a cloud-based personal wiki notepad" for the iPhone, iPod and iPad. "You Type, and it Links! It allows you to organize your information easily and get to it wherever you are." Its cloud is here. It's also supposed to accessible through the desktop. I am not going to shell out the money! TrunkNotes, which uses Markdown and can sync through DropBox, seems a better deal. It costs $3.99 (one time). Where is the sense of gratitude and wonder that we used to have? A tech company sells millions and millions of an amazing smart phone, but decided to create a new model by investing untold amounts of money and energy. And then they released it for the same price as the last model. They didn't have to, but they did. To moan and complain about that smacks of entitlement and selfishness. Here are people who paid good money—arguably too much money for something—and did not get what they expected. They complain, and now they are told sanctimoniously that they are "selfish" because they complain. Oh ... and apple invested "untold amounts of money and energy" just to make people whole again? Expected profit has nothing to do with it? Give me a break! What planet are people like that coming from? They make me sick! If the present customers are unworthy of Apple, Apple should get a whole new set of more worthy customers. Whitelines Link is an application for iPhone, ipod Touch and iPad that automatically detects and scans your paper. It removes background noise, autocorrects tilt and contrast and provides you with crisp, sharp notes, both in color and black/white. Share your notes and ideas with your friends by e-mail or save them in Dropbox and Evernote." It's "a happy combo of physical and digital notes," they say, which makes me happy for the combo. It needs special paper, but the Website says nothing about where you should (could) buy it. There is, however, another Website that allows you to print "free paper" and has a link to a shop in Sweden. The Markdown craze started on the Mac Platform. Recently, there have appeared quite a few different versions of Markdown Editors on the Windows Platform. I reported on some of these. Markdownpad seems to be one of the more popular ones. Downmarker does not seem to be a top contender. It is one of the more simple incarnations. However, it allows you easily to link pages, using references to local files Markdown style: "(Mylink)[Myfile.md]". While the linking is not fully automatic, it works quite well. You can thus create easily a simple Markdown wiki (even in DropBox, if you wish). It is simple, but not simple-minded. It's rather elegant. And it is free. 1. See here. See also an opinion on what is the best Markdown editor to use. But see also this dissenting view. 2. You can download Downmarker from here or, perhaps better, here . KnowsyNotes "is an organizer and editor" for plain text notes (*.txt) and spreadsheets (*.csv)." Its default format for text is Markdown. It is available only for Windows. A 30 day trial is available. The price is $24.99. One of the things I like most is that it allows you to link easily to other documents, images, and Websites using free inks, i.e. the bracket convention: [linked file]. Aliases are allowed. Files have to be in the same directory. Like a personal wiki (and most markdown applications) editing and viewing are done in different modes. Besides Markdown, it can also use a subset of the blade wiki markup. It uses the familiar folder structure for organizing data. This means you can use it with files previously created. Its capabilities are fairly rudimentary, but, if you need (or want) to display and edit csv files and have a markdown editor with some wiki-ability, KnowsyNotes is the application to buy. Obviously, the developer wants the user to make the association between "knowing" and "notes." Unfortunately for me (or him, because I have the feeling others will be similarly inclined): "knowsy" suggests "nosy," or the state of being offensively inquisitive about personal matters. Would I really want to let other people know that I have some "nosy notes"? To end on a personal matter that does not require nosiness by anyone, it does only one thing that ConnectedText does not do, namely display csv files. Since I do not need this capability frequently, I will not pay the $24.99. But this should not persuade others to dismiss this interesting and very promising application. I recommend it to anyone who finds ConnectedText "too much." Some people will like the Multibar, reminiscent of Notational Velocity. Others will like especially the ability to keep the files in DropBox. Lets go through his account again, shall we? I am Philip Roth. I had reason recently to read for the first time the Wikipedia entry discussing my novel “The Human Stain.” The entry contains a serious misstatement that I would like to ask to have removed. False. There was absolutely no misstatement in the article. What the article claimed at the time he wrote this open letter was that “Kakutani and other critics were struck by the parallels to the life of Anatole Broyard, a writer and the New York Times literary critic in the 1950s and 1960s who was of Louisiana Creole mixed-race descent and passed for white”. This is entirely correct. Kakutani was struck by the parallels, and has stated this, as have Brent Staples in the New York Times and several other literary reviewers and authors. Some people had indeed the impression that there were parallels different from those that Roth himself reports. And Wikipedia reported the fact that someone had such an impression. We all know that impressions by someone (anyone?) are more important than what a primary source reports. Do we? Well, in my view this is even more idiocy of the Wikipedia kind! What about a sentence like: "Philip Roth claims ...", followed by a footnote reporting the "fact" that "others (previously) have had the impression that ..."? Even better, I'd like some argument as to why someone's "impressions" are to be preferred over the claims of the author! And who the hell is (was) Kakutani? I hope it's not the same one that Jonathan Franzen is said to have called "the stupidest person in New York City." "Calepin is now an open source project for education and fun; calepin.co is shutting down." No further comment! In a recent Open Letter to Wikipedia Philip Roth relates his experience, trying to remove false information from an entry about him. "I recently petitioned Wikipedia to delete this misstatement, along with two others, my interlocutor was told by the “English Wikipedia Administrator”—in a letter dated August 25th and addressed to my interlocutor—that I, Roth, was not a credible source: “I understand your point that the author is the greatest authority on their own work,” writes the Wikipedia Administrator—“but we require secondary sources." They require "secondary sources." It does not matter whether the secondary sources are reliable or not, as long as they are secondary. This policy turns all good rules of scholarship and—I suppose—journalism (not to mention encyclopedia editing) upside down. Primary sources are ... well ... primary sources and secondary sources are secondary to primary sources. Unless there are very good reasons to go with what is secondary, you should rely on the primary sources. In the case at issue, the burden of proof is on Wikipedia, not on Philip Roth. If only Jonah Lehrer had had the gall of the Wikipedia people! What has become of Wikipedia because of their so-called "experts" who lack any common sense is despicable. 1. It definitely seems that lack of common sense and, come to think of it, lack of intelligence are necessary condition of the possibility of becoming a Wikipedia cop. It is often forgotten that outlines are not "natural" in the sense that they indicate a natural way of thinking about matters. They are a highly refined kind of instrument, and just as refined sugar does not occur naturally, so outlines do not occur without refined thinking. Table sugar made from sugar beets has undergone the following process: "the crop is washed and sliced and the sugar extracted by diffusion. The raw juice is then treated with lime and carbonated in a number of stages in order to purify it. Water is evaporated by boiling the syrup under a vacuum. The syrup is then cooled and seeded with sugar crystals. The white sugar which crystallizes out can be separated in a centrifuge and dried" (Wikipedia). Outlines are conventions that are just as artificial. Outlines seem to presuppose techniques that became popular only when paper and printing became a main staple in Western culture. It is sometimes claimed that Ramon Llull (1232-1316) "invented" outlines. I doubt this is true, but his writings certainly popularized this way of organizing materials and it was around his life time that outlines first appeared. Essentially, outlines are a typographical means of presenting hierarchical information that evolved to the highly elaborate convention we know over a long period. This, does not mean, of course, that what is nowadays represented in outlines was not possible before. Systematic or hierarchical thinking was possible before (just as honey and other substances could be used for sweetening, so hierarchical thinking was possible before outlines). Rhetoricians have always given advice on how to present things in speech. Cicero advised, for instance, that speeches should contain a section, called partitio in his De Partitione Oratoria Dialogus, also called Partitiones Oratoriae and De Partitionbus Oratoriae, translated as "On the Subdivisions of Oratory," and other ancient writings show that they have a systematic structure. But the convention that we call "outline" was not available to him. by the eighteenth century, outlining in the modern sense was well established, and during the nineteenth century it became a standard way of working. But the history of outlining has not yet been written. It might be argued that outlines are making systematic thinking easier and that the kind of systematic classification you find in someone like Carl Linnaeus (Carl von Linné) would have been difficult without them. Perhaps it is even closer to calculus, which was invented or discovered by Newton and Leibniz, that allows us to do things that were not possible before. But, just as the mastery of calculus does not make anyone into a Newton or Leibniz, so the mastery of outlining does not turn someone magically into a systematic thinker. Software programs that mimic and improve on written outlining also help, but they do not come with guarantees either. Nor is any style of outliner that is inherently better or worse than any other. 1. The last claim should not be taken to mean either that there are not some outliners that are better than others. I prefer one-pane outliners for outlining, but two-pane outliners are good for fleshing out one's ideas. To overwork the analogy with sugar. Sometimes brown sugar is better than table sugar, and, for breakfast, nothing beats honey (unless you are diabetic, of course). I have always liked Treepad. But, since moving to the Mac and Parallels, I have not used it. One of the reasons I liked it, is because it easily allows you to switch between viewing the the tree only and seeing both the tree viewing the entry only, and viewing both (Ctrl-F11, Ctrl-F-10, Ctrl-F12). I even used to use it as a replacement for MS-Powerpoint. Now I use Keynote. Because I had to look at some old files (the semester starts tomorrow) I installed both Treepad Lite and Treepad Business. I am sorry to say that Treepad Lite does not work for me because it does not allow me to insert new nodes with a Mac keyboard. Treepad Business works, since the return key inserts a new node (and the nodes can be promoted and demoted with Alt-Right and Alt-Left. I doubt I will use it much, as I do my windows outlining right in ConnectedText and on the Mac I use Sribe for simple outlines. I came across this. It's interesting to me, as I own one of those things. I received it as a Christmas present many years ago. It was bought at the Bombay Company. 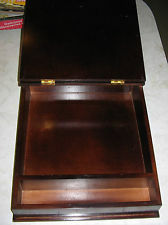 Some writing desks very much like the one I own are available at eBay for under $100.00. Mine is not for sale because it was a gift, and I still harbor illusions that I will use it one of these days (probably in retirement). I have a feeling these types of implement considerably predate "Victorian times," but have not done research on it. One of the reasons why these things were popular in earlier times has probably to do with the lack of desk space. My preference for this approach is the reason why I find outliners not very useful in collecting notes. Nor do I think that this preference is a merely subjective attitude. Thinking in terms of headings is primarily exclusionary thinking. It has a use later in the process or activity that is note-taking. As you know, I use Notetab. But I have not upgraded to 7.0 so far, as I found none of the changes compelling for my purposes. I would have desired new feature for the Outline and linking of topics. That I have not yet upgraded doesn't mean I won't in the future. It's just not a priority at this time.